We help quality-driven companies realize a lower total cost of ownership by delivering customer-focused manufactured solutions, with the access and accountability of a true partnership. 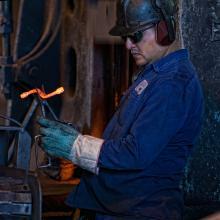 Green Bay Drop Forge is a premier custom forging and standard steel forging manufacturer. We are also a manufacturer of machinings and assemblies. Green Bay Drop Forge proudly supplies outstanding solutions for Original Equipment Manufacturers (OEM), Fabricators and Distributors in the U.S., Canada, Mexico and Europe. However, all of our forging products are proudly made in the USA. Green Bay Drop Forge is a member of the Forging Industry Association and is ISO 9001:2015 registered, ensuring the industry's highest quality. See below for more information on Green Bay Drop Forge capabilities, services, products and industries served. We offer a wide variety of standard and custom forging products to suit diverse applications and industries. Products can be ordered in varying quantities based on need. View the standard and custom forgings available in the dropdown navigation of the website for additional info. Whether you need to order existing product or you need custom forgings or forging services, turn to Green Bay Drop Forge, a leader in the industry for over 100 years. We'll provide the solution best suited to your application and budget. Contact Green Bay Drop Forge for general inquiries, or Request a FREE Quote! General Motors has awarded Green Bay Drop Forge, a Tier 1 supplier, their annual Supplier Quality Excellence award, which is reserved for suppliers that have met or exceeded their stringent quality performance criteria. Green Bay Drop Forge has successfully completed an external audit of its quality systems and is pleased to announce the renewal of ISO 9001:2015 quality standard certifications.